Online video presents a huge opportunity for you to add tremendous value to your brand, whether you overall goal is increasing conversions, improving brand confidence or simply to show you care. With the advent of social streaming platforms such as Periscope, and in a world where the majority of marketers already have some way of recording HD video and access to easy-to-use editing software, it’s clear that no matter your budget or ability, you can create valuable video content. I’ve gone through some of the best user guides to making engaging video, and I’ve highlighted a few of the key steps that experts are suggesting you consider when creating video content. What does your audience want to see? Making the effort to understand what your audience wants can add a huge amount of value to your video. Before settling on an idea for your video, spend some time getting to know your audience, looking at what they want to know about your brand and what they are talking about in the industry. Once you’ve identified a topic for video content that you think your audience would enjoy, the next consideration is you and your brand. Does your video idea fit with your brand’s goals? 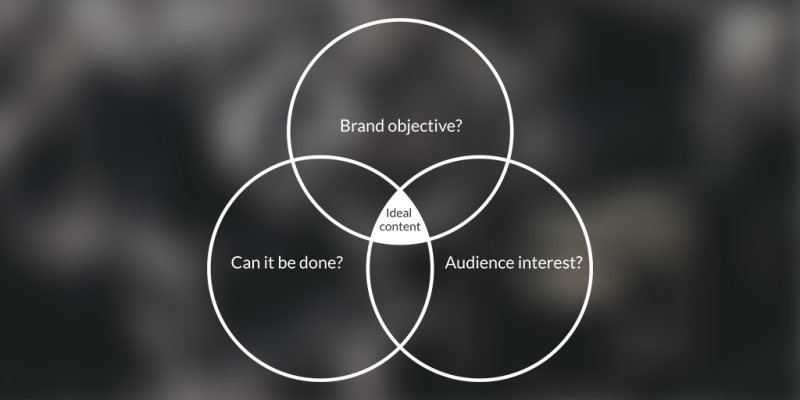 What is a brand’s objective? What is the audience interested in? And how can this be done in real time? Here’s a neat Venn diagram that touches on the intersection of these three key questions. Aim for video content that can answer “Yes” to all three questions. Once you’ve figured out what your audience wants and how that fits with your brand’s goals, you can move ahead on creating the video content. The Buffer blog has covered some ways to easily get started here. To make your video more interesting and shareable, there is some really intriguing advice in terms of the psychology and emotions behind video content. One of my favorite stories on the topic was shared by Christina Desmarais at Inc. Christina wrote about the strategies at Unruly, a marketing company that specializes in viral video. Unruly determined 18 psychological responses that your video should aim for. Among these, the positive emotions are the ones that are most effective at driving social shares. Emotions like happiness, exhilaration, and amazement (the first five listed above, in particular) are great indicators of a successful video on social media. The sharer believes the product or service could be useful to friends. It demonstrates the sharer’s knowledge or authority on a subject. So when creating a video, keep in mind the emotions you’re creating with your video and the reasons why someone might share it. And in case these ideas seem a bit vague (I know I can sometimes struggle in this area! 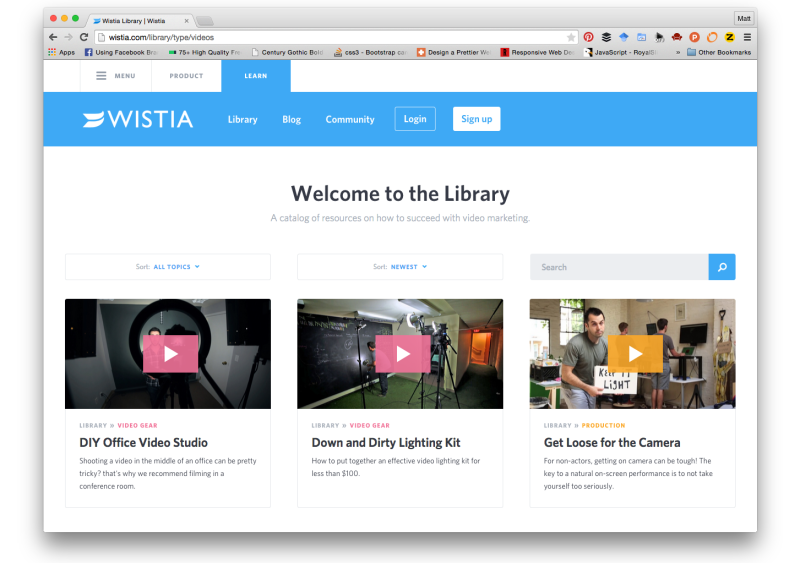 ), here are some helpful resources from Wistia on the topic of emotions and video. When Is It Best to Use an Emotional Video? tl;dr – Write a script that captures the emotional voice and tone of your brand, choose music that elicits the right emotion. After you’ve spent hours successfully creating this amazing content that is tailored toward your audience while aligned with your brand objectives, how do you even know if it worked? You might already know you need to set some KPIs,but which metrics even matter? Audience: Look at the # of views from your target demographic or a video’s % of views from that demographic. Expression: Look at how much watch time the video has accumulated, both the total amount and the average time each viewer is watching. Look at the # of subscribers your videos are earning, or the % of new subscribers you’re picking up compared to the number of views your videos are getting. You can also measure how many clicks you’re getting through to your website. Key tip: Contrary to popular belief, you should focus on how many times the video has been shared, NOT viewed. The action of sharing is the gold standard in social, a metric in itself which offers a big opportunity to influence brand metrics and performance. I’ve handpicked three of my favorites. Each one provides great value for their audience and illustrates different ways you might use video, add value and connect with your audience. What questions do you have about including video on your content marketing strategy? How do you measure the value of your videos? Have you experienced some great brand videos? I’d love to hear what you think in the comments.